Get your 2018 calendar – Designed by the children of Hull! Proud Hullensians can snap up some original artwork which celebrates their home city. 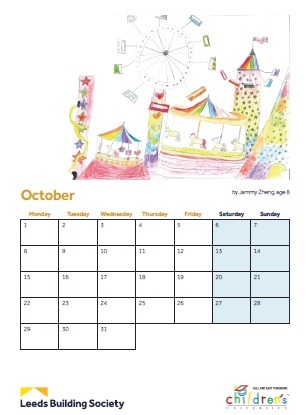 Leeds Building Society challenged local school children to create a design which showed what they love about Hull and the winning drawings, paintings and collages have been turned into a charity calendar. The 2018 calendar is raising funds for Hull and East Yorkshire Children’s University. 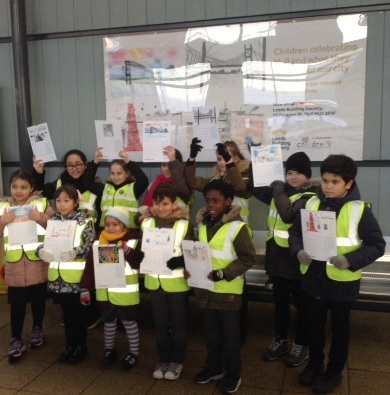 The winners, who range in age from four to 11, collected their prizes at a VIP viewing at Hull Paragon railway station, managed by train company TransPennine Express, where their designs are gracing the concourse over the coming weeks. “The calendar has landmarks including the Humber Bridge and the Maritime Museum, and it was difficult to pick the winners from so many lovely pictures,” said Denise Woodall, the manager of Leeds Building Society’s Hull branch. 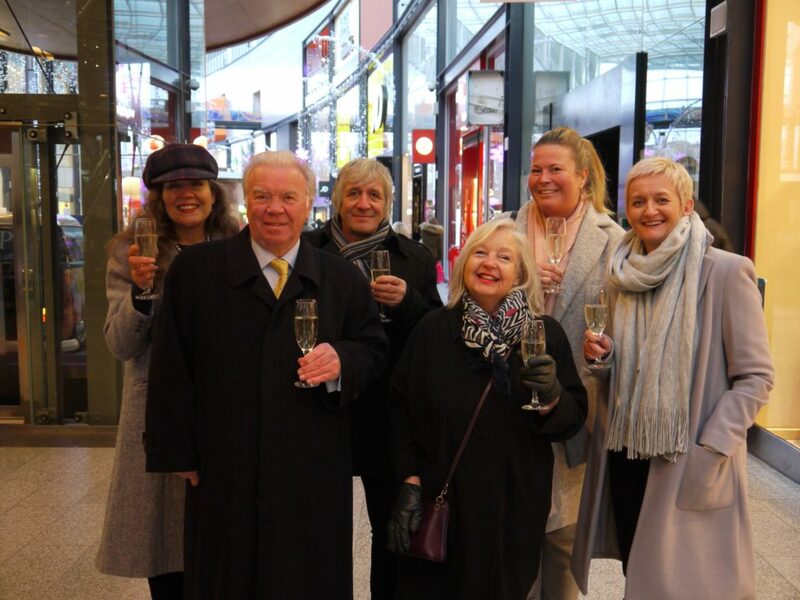 “We’re thrilled TransPennine Express offered to display the artwork at Hull Paragon station so it can be seen and enjoyed by thousands of people every day. David Hatfield, Station Manager at Hull for TransPennine Express, commented: “We are thrilled that the station is playing host to these wonderful works of art created by our young people. Rose James, Partnership Manager of Hull and East Yorkshire Children’s University, explained where the funds raised from the calendar would be used. The calendar costs £5.99 and is on sale now from Leeds Building Society, 78 Paragon Street, Hull HU1 3PW. All proceeds go to charity. 2017 has been such a great year for our charity and has been our busiest yet! We have won awards, including a Weston Charity Award which granted us acceptance on the Pilotlight Programme. This programme paired us with highly respected business experts who offer advice and support with the strategic direction of the charity. We have had two of our volunteers, Mark Stockdale and Ruth Truelove, receive British Empire Medals for their services to education and our founder Dr. John Buttrick received an MBE at Buckingham Palace. Another of our volunteers won Volunteer of the Year at the Hull Daily Mail Golden Apple Awards. In November, our Director Natasha and Partnership Manager Rose had the honour and privilege of having lunch with Her Majesty the Queen during her visit to Hull. We were lucky enough to have three projects funded by Hull 2017. Our Song for Hull project with the NHS choir and our Children in Care Visual Celebration event were both funded by the Creative Communities grants. Our Digitull project was funded by the No Limits programme and meant that every child in the city had the chance to engage in the City of Culture celebrations. We also ran two additional City of Culture projects with the support of local businesses. Arco supported our BBC Reporters project which saw children become official BBC correspondents for the Hull 2017 events. ABP funded the “I Love Hull” Container Project which gave local children the opportunity to have their artwork printed on a container that will embark on a trackable journey around the globe. We also released our very first Christmas single which has reached over 60,000 people! Even though we have been so very busy, we have still managed to reach 6,000 local children this year and we hope to reach even more children in 2018. We would like to thank our trustees, tutors, volunteers, partners, donors and friends for all of your support this year. We wish you all a fantastic 2018! 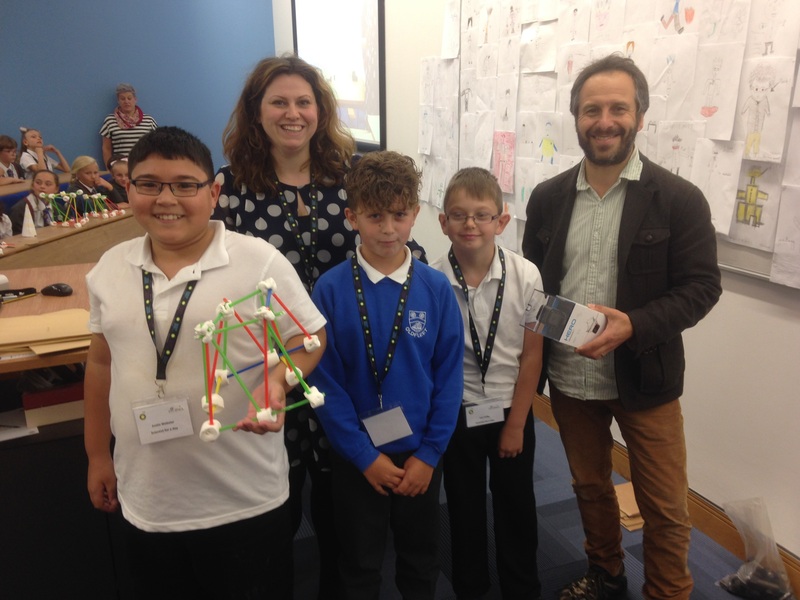 HEY Children’s University and BP have formed an exciting new partnership which saw sixty-five children from across Hull and East Riding of Yorkshire come together at the University of Hull to take part in a Science Technology, Engineering, and Maths (STEM) event. Forces, Motion and Bloodhound SSC, learning about the land speed record and its history, the children went onto conduct their own experiments. Team building, focussing on the art of communication, job roles and responsibilities to complete a build out of Lego. Ex’straw’dinary Engineering, children created an oil platform out of straws and marshmallows to create a structure. The two strongest structures from each school went forward to a live experiment during the afternoon lead by Professor Mark Lorch. There was an air of excitement as schools went head to head to see whose structure was the strongest. Pupils from Oldfleet Primary School were announced the winners and received a Go Pro Camera. Last week, it really was the most wonderful time of the year at HEY CU as we arranged for Santa Claus to come to town for our Breakfast with Santa visits! Santa and his HEY CU elves took a sleigh ride and visited 5 schools to give deserving children a Christmas that they would never forget. The children had no idea what was about to happen when our team of smiley elves knocked on their classroom door. “Here comes Santa Claus” the children cried, as Santa himself walked into the classroom shaking a set of silver bells. 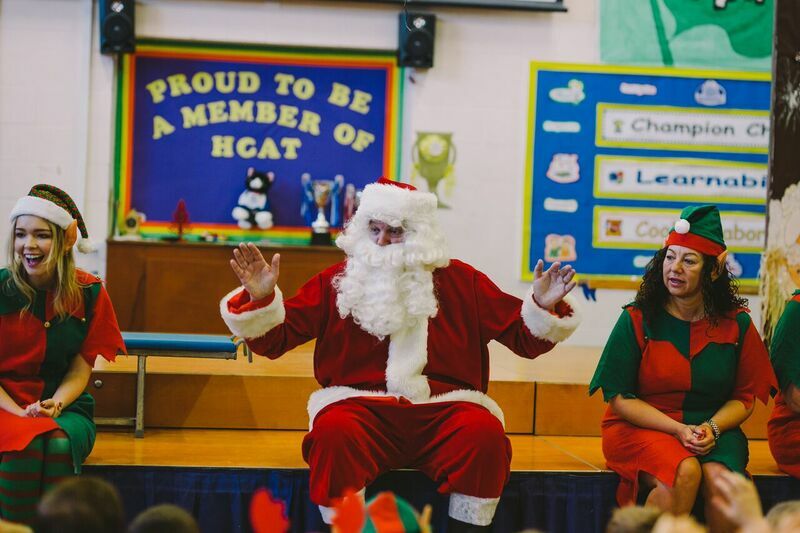 Santa asked the children if they would like to sit and have a special Christmas breakfast with Santa (provided by Tesco Hull St Stephen’s) and the children were very happy to accept! After the children devoured their Christmas treats, they had a fantastic time rockin’ around the Christmas tree with Santa and his elves as Christmas music rang around the room. Just when the children thought their wonderful Christmas time couldn’t get any better, Santa asked them if they would like some presents! The children squealed with delight as the elves carried through sacks full of presents with the children’s names written on them. It really did feel like Christmas time! 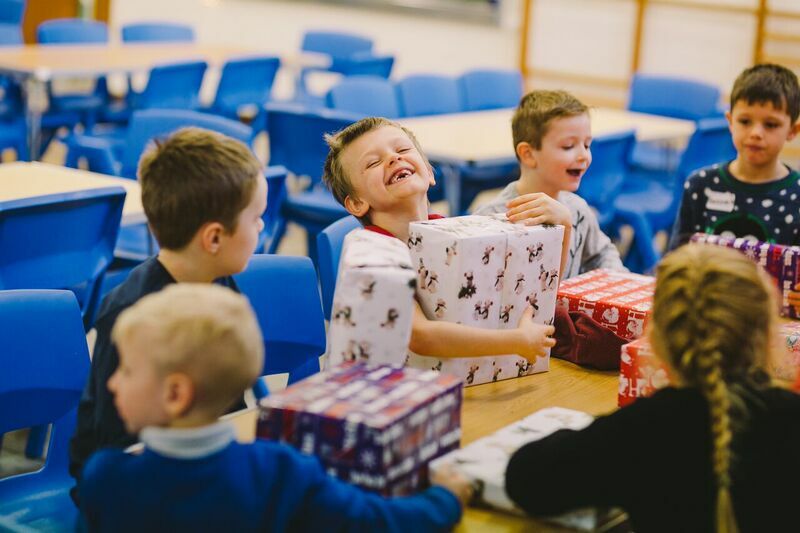 Each child was given a gift and asked to sit quietly until Santa shouted the words “open them!” The children couldn’t believe their eyes as they unwrapped exactly what they asked for from Santa! Then it was time for Santa and his elves to say farewell and drive home for Christmas to finish packing all of the presents for the children of the world. 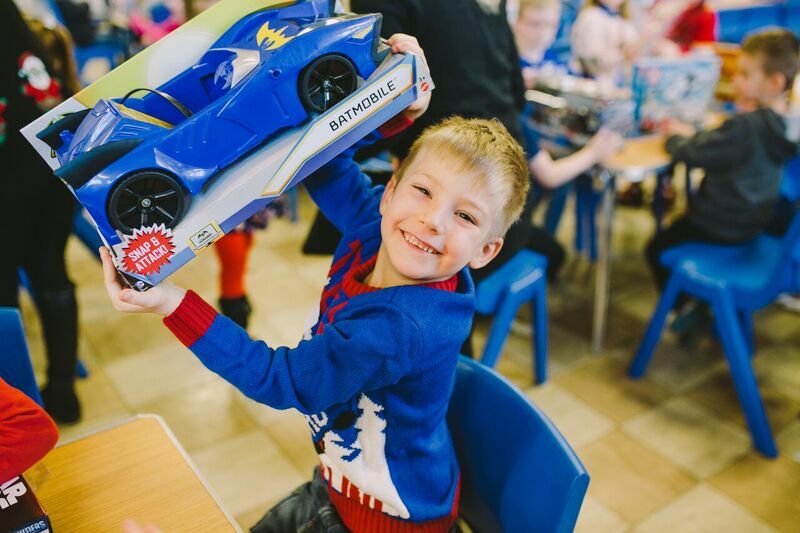 Thank you to J Marr Seafoods, Pamela Gale, Hinks Insurance, Sonoco Trident, MKM, Hays Recruitment, Beal Homes, Northern Gas Networks and Denise Morgan for sponsoring the presents for the children. You really did make it a fairytale for them. Merry Christmas everyone! From everyone at HEY CU. Our Paintbox masterpieces are in St Stephen’s! A unique exhibition of inspirational artwork was unveiled at St Stephen’s on Thursday 30th November. The exhibition has been arranged through the Hull & East Yorkshire Children’s University and made possible by the generosity of Aberdeen Enterprise Finance LTD of Pocklington. 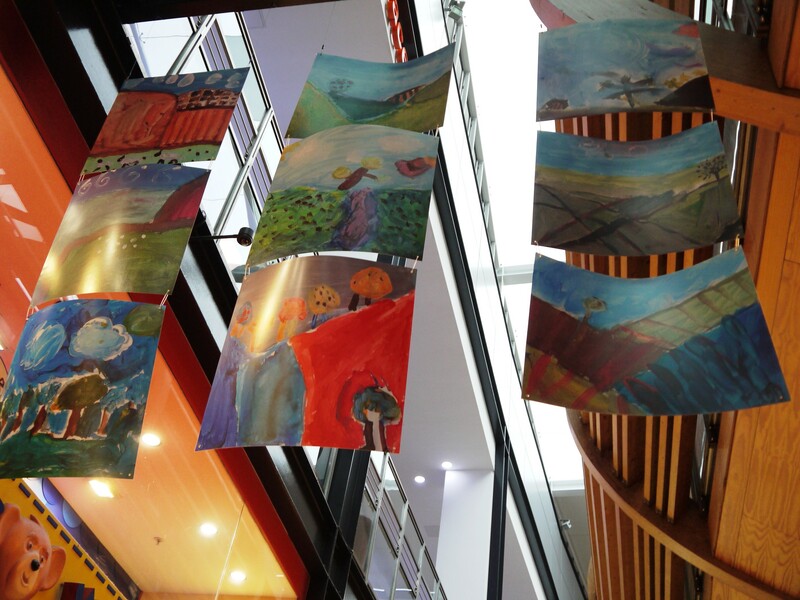 The junior masterpieces have been created by 100 City of Hull primary school children. Each of the children walked and sketched the beautiful countryside of the Yorkshire Wolds and worked with local artist Rose Horspool to create some stunning artworks. The children were based for the day in the Wolds Heritage Centre at Warter, near Pocklington and with their own sketch books in hand, worked as true artists. Having also looked at the work of David Hockney and the paintings he created on the Yorkshire Wolds their paintings also reflected his love of bold colour and vibrant style. The work on display is a selection of all that has been done as part of the Children’s University “Paintbox” module. This is a local charity that provides children from disadvantaged backgrounds with experiences outside the classroom that raise their aspirations. Last year the charity worked with almost 6000 children. In the last academic year 2016-17 fourteen schools have taken part in the experience amounting to 384 children from disadvantaged backgrounds being inspired to think about creative careers. Jim Harris, centre manager of St Stephen’s said “We have supported the Children’s University for a number of years and we are delighted to be able to provide a platform for the children to display their work. I would urge all visitors to look up and be inspired by the superb artwork produced by these talented 7 to 10 year olds”. The exhibition of work will be hanging in the main shopping area either side of the main stairwell until the end of January 2018. 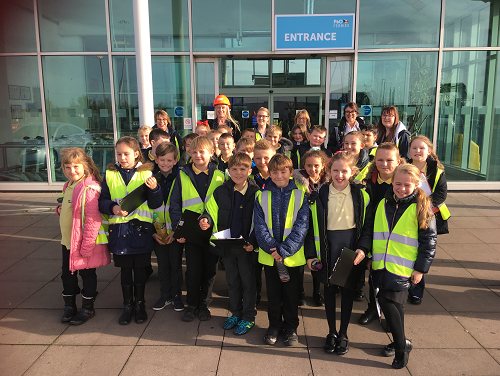 Earlier this month, thirty pupils from Bay Primary School in Bridlington, went on a special behind the scenes tour of P&O Ferries and Associated British Ports as part of a Hull & East Yorkshire Children’s University experience, to raise their aspirations and give them an insight to the world of work. The children had the pleasure of meeting crew members on board P&O Ferries, from engineers, entertainment staff, chefs and team members who look after passengers to discover more about their roles. They asked questions to find out how long they’ve been working onboard the ferries, what qualifications are needed to do their jobs, and if the enjoy what they do. The children learned some of the crew are from various parts of the UK, Portugal, Holland, and the Philippines, finding it fascinating the number of different languages spoken onboard. Pupils then toured the Ferry, discovering the history of P&O, where the cars and animals are stowed. They also saw the different restaurants onboard, cabins, entertainment areas and much more. Following the tour of the Ferry, pupils were then met by the ABP Humber team, hopping back onto the bus to learn about the Humber as a Port. Pupils found out plenty of interesting facts realising the employment opportunities associated with imports and exports. Over 30,000 people work on the dock each day including all the ships and crew. ABP import 92 million tonnes of cargo each year, including everything from steel to donkeys and everything in-between. To help put things into context the children found out the port is 230,000 square metres large, equivalent to 32 Wembley Stadiums, and staggering 48,000 bananas would fit inside one 20-foot container. Following the visit, the staff and children held an assembly for the whole school and parents, highlighting what they learned from the experience, linking into their Archie Bishop ‘Be the change you want to be’ project. If you would like to find out more about our work in the East Riding of Yorkshire, contact Lisa Whitton, East Riding Manager of HEY Children’s University lisa.whitton@hull.ac.uk or 07759 300495. Today we launched our very first Charity Christmas single, with an accompanying music video, to be sent out as our e-Christmas card and raise money! 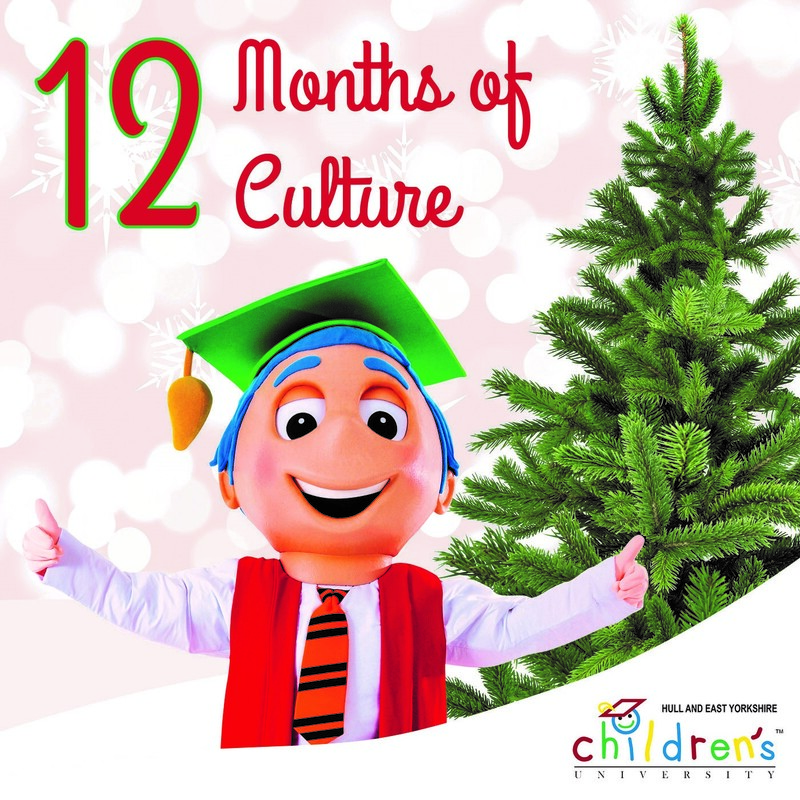 The song is a new version of the 12 Days of Christmas where lyrics have been rewritten to celebrate all things Hull and our fantastic city of culture year. The usual “turtle doves”, “French hens” and “calling birds” have been given the Hull treatment and are now “Larkin toads” “Dead Bods” and “Volunteers”. The focal line of “A Partridge in a Pear Tree” celebrates Hull icon Jean “Busy Bee” Bishop -“A lady dressed as a bee”. With a team of only 6 full time staff at HEY Children’s University, it was clear that we would need some help to make the project a reality, so Rose contacted Wayne Willis at yesyesBD, a Hull-based creative consultancy, and he kindly agreed to help arrange the recording of the song and the filming of the video. Smailes Goldie loved the idea of the project and agreed to be the sole sponsor. The accountancy firm are also using the video, in which some of their staff appear, as their e-Christmas card. The song was recorded at the Portobello Methodist Church with local choir Do Re Mi providing the vocals. The Choir will perform the song at their Christmas concert this weekend and will be fundraising for HEY Children’s University at the event. The accompanying music video was shot over 2 days in key locations around Hull. Over 40 volunteers took part in the project including Olympic gold medallist Luke Campbell, BBC Look North’s Peter Levy and “Face of Hull” Kofi Smiles. “We are incredibly grateful to Smailes Goldie for sponsoring the project and we hope that everyone enjoys the video as much as we do!” Rose said. The song is available to download from all major digital stores. All profits will be donated towards helping children living in disadvantaged areas of Hull and the East Riding.